a medium-light body background. A golden hue and white frothy head help to round out this Imperial Ale. This kit is easy to make, and the beer is just great. The kit comes with a packet of corn sugar to prime your batch for bottling. I added this per the instructions, and ended up bottling 10 x 12oz bottles (topped with the included caps) and 11 1L swing-tops. Two weeks after bottling, the 12oz bottles were slightly undercarbonated for the style, but the 1L bottles were almost perfect. I’m sure that will even out as the beer matures. The result was a high-grav IPA with a mostly citrus hop character and a hint of pine. This brew seems very full-bodied compared to commercial beers, but I find that to be a good thing. To sum up, this beer turned out almost exactly as the kit described. IBUs are almost certainly 100+ and the color on mine was amber, despite the Deep Gold color indicated by the instruction sheet. ABV listed on the sheet were 7.8%-8.3%, and mine was 8.4%. 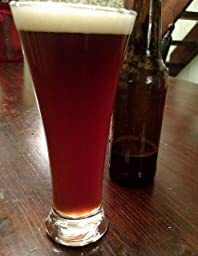 This is a very delicious brew, and I’m definitely going to make it again. First homebrew in many years. Instructions were clear and easy to follow. Two weeks in primary and two weeks bottle conditioning resulted in a very nice brew. The beer is a medium amber with a thick creamy head. There is a good balance between the malt and hops but make no mistake, this is a big beer. Any less alcohol or hops would make this a bit too sweet for my taste. If I brewed this again, I’d probably dry hop for a little more aroma. This kit has everything you’ll need to make a fine double IPA – As good as any of my favorite craft brewers products. All of the ingredients are of the highest quality and all grains and sugar etc was packaged very well. The reason I purchased it was simply because it contained almost everything I normally use in my IPA with a few minor brand differences that actually made things interesting. Order it – you won’t be disappointed!! !